This is Centre County, PA. in the middle of Pennsylvania. Home of Penn State University, State College, Bellefonte, Philipsburg, the Centre Daily Times and CentreConnect. It's also in the Centre Of the Web, home of iul.com, the EBCC and several chamber of commerce organizations. The alphabet soup links above are a gateway to Centre County. 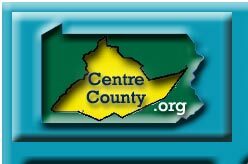 The WebSites linked on the right above represent all the government, business and tourism organizations in Centre County. The four links below the logo are included to give you easy access to anything you can't find on the other sites. This site is here for YOU. Look for our logo/link at the bottom of participating local sites who have chosen to join us in our effort to make our area of cyberspace easier to navigate. If you have a WebSite in, around or about Centre County, please feel free to get involved in our Logo/Link program, or if you have any clout with anyone in charge of such a site, please urge them to get involved. It's easy, costs nothing and performs a vital public service. Thanks to all the WebSites who have joined us in our Logo/Link effort. Also, thanks to Alta Vista for this "Real Time" Information. Here's a Great Map Of Pennsylvania. © 1998 - Centre Of the Web, Inc.